As cold as it may be, I am not letting this weather get me down and I am determined to brighten up my wardrobe! Throwing caution to the wind, swiftly followed by my coat, I am going big and bold and out of my comfort zone this season, and why not do it in pink. 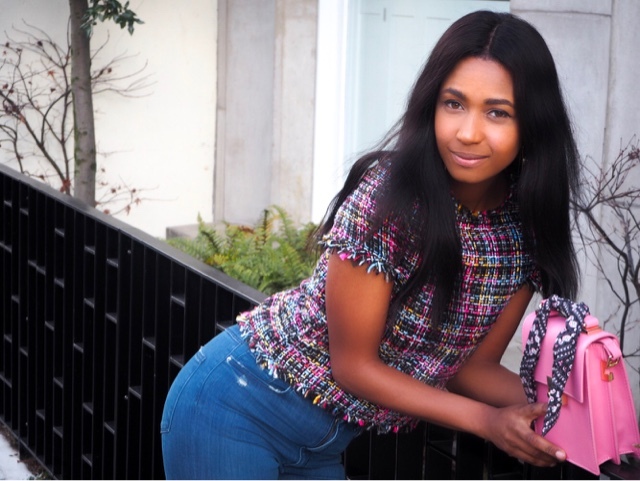 Pink is the colour this SS17 and the brighter the better, I am slowly easing into it, with slight injections with my new Zara bag and top, ok the whole kit from head to toe! 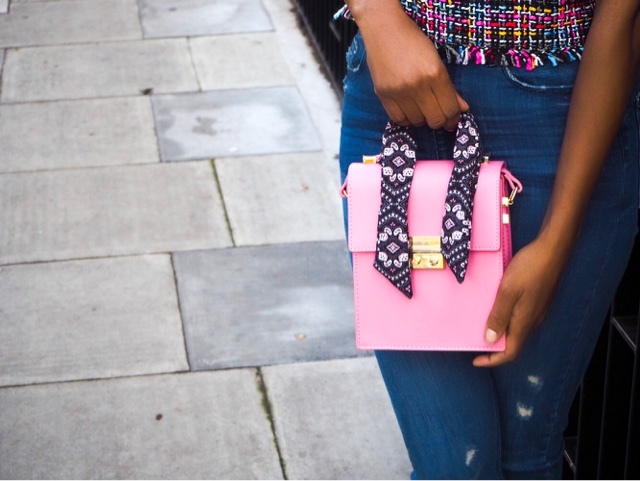 As soon as I saw this super feminine scarfed city bag I knew that I just had to have it, and no way could I have left it behind, it would have been madness to of done so. It softens up my outfit and I know that I will get loads of use out of it and dare I say it, more girlier by teaming it with a floaty dress and heels obviously when the weather picks up. 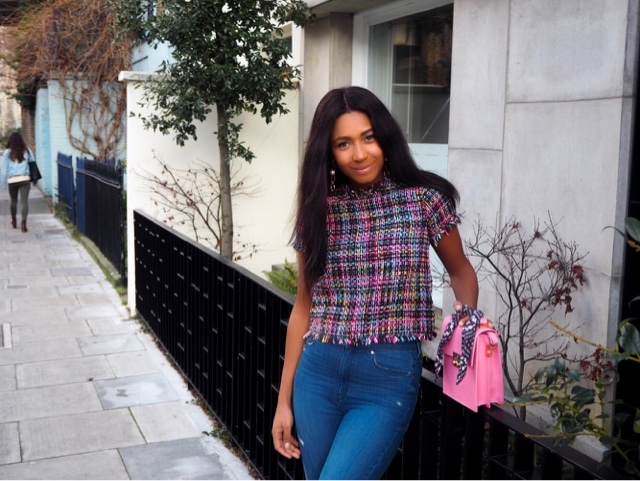 No questions were asked when I gazed upon this tweed top, it was an instant hit and must have and I clutched at it for dear life, they had a matching skirt, but thought better of it, didn't want to come over looking like Cher and Dionne from Clueless! I happily popped it back, maybe I'll return for it at a later date if feeling a bit braver. As I wandered through the store, eyeballing all the new season collections, I stumbled literally over these fabric mules and they are a great price at £29.99. Do not think I will be wearing them too much just yet, don't want to lose my toes to frostbite, but will be stomping around in these once the chill breaks. A little side note, go the next size up in the top, I went for the medium and I would normally get a small, but Mumma has no tattas but, it felt a tad too snug! Nothing says comfort than a new pair of jeans or old, but the feeling is great when they are all snug and new don't you think? I practically live in jeans so finding the right pair is true bliss and I've collected a tonne over the years, but with so many styles and cuts on the market, you are spoilt for choice. I've been coveting a pair of distressed jeans especially at the hem of the leg, I was pleased as punch when I spotted these and snapped up these high-waisted ones. 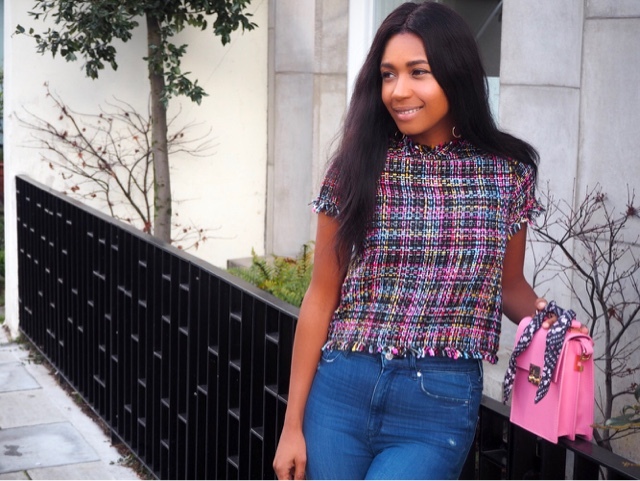 So I hope you like my new outfit post, will you be rocking tweed or pink this season? How will you be styling yours? Or have you been brave enough to wear your mules out yet, how did it go?